These acrobatic insects that are consuming the leaves of my Harry Lauder’s Walking Stick might resemble caterpillars but they are not. These are sawfly larvae, the larvae of not a fly at all but one of 4,000 varieties of a primitive stingless wasp. Look closely. The larvae of moths and butterflies have 1 to 4 sets of abdominal prolegs (false legs), whereas sawfly larvae have 6 sets of prolegs. Mouthparts are for chewing and in great numbers they can defoliate a tree or shrub or flower. Most of them are somewhat host-specific and feed on foliage of specific trees and flowers. Some larvae work together on the leaf edges like these, some skeletonize leaves, some eat holes in leaves, some roll leaves, and some varieties create galls. The most common varieties here feed together and some hold their abdomen in the air like these. A defensive mechanism in many larvae is a row of glands on the abdomen that can expel an irritating fluid. The benign winged sawfly adults are small and generally dark in color. They do not have the constricted waist of many stinging wasps and the females have a saw-toothed ovipositor, which is used to ‘saw’ into plant material and deposit eggs. There is only one generation per year but the larvae can be destructive if they are numerous enough. Ten years ago we were inundated with the Loblolly Pine Sawfly that destroyed a number of our young trees. This entry was posted in gardening, Horticulture, insects, nature, Virginia and tagged insects, nature, Sawfly Larvae, Virginia by Annie. Bookmark the permalink. Do you remove them or allow them to eat? My Harry Lauder has just a few larvae, most likely the Dusky Birch Sawfly larvae. I left them on the leaf because they won’t do much damage and they are a good food source for birds and small animals. Even squirrels eat them! Unless there is real threat to the plant, I let nature take its course. But I will monitor the plant. My Harry Lauder is being eaten by something but no signs of the bugs. Great article. Thanks. Thanks for the info. those little buggers have been eating away at Mr. Lauder walking stick. I tried Neam oil, didn’t work. i will try the dish soap & water. We’ve been organic gardeners for 20+ years and have never had these little guys give us such a fit. These little fellows have eaten every leaf on my two year old (grafted) weeping willow. I have sent them all to hell for their folly. There are plenty of buds on the tree so I am hopeful that it will live on!!!!! So sorry about the (late) willow sawfly larvae defoliating your weeping willow. With all those buds, it will recover, I’m sure. 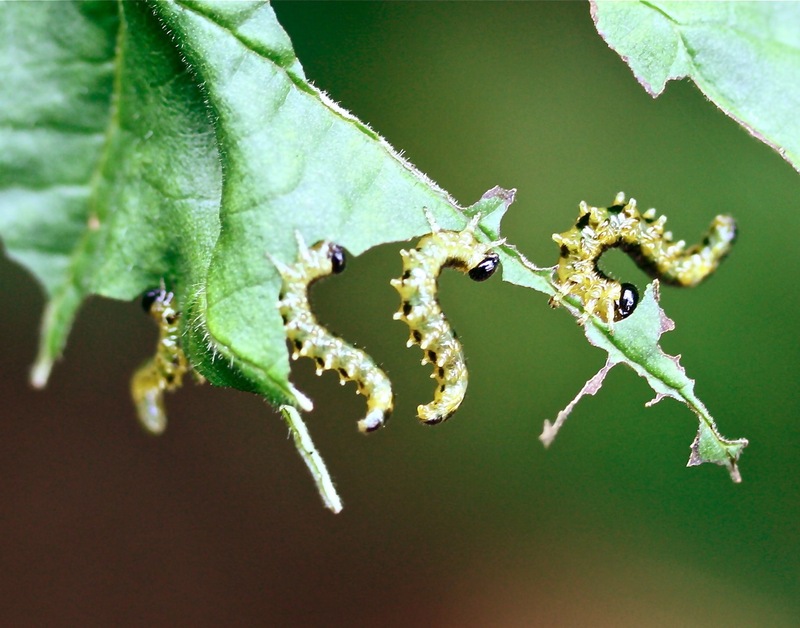 Caterpillars and sawfly larvae have prolegs but caterpillars have hooks called crochets on the end of their prolegs. This is a good way to identify whether what you see is a member of the Lepidoptera order of butterflies and moths or the Hymenoptera order of ants, bees, wasps and, our hungry little sawflies.